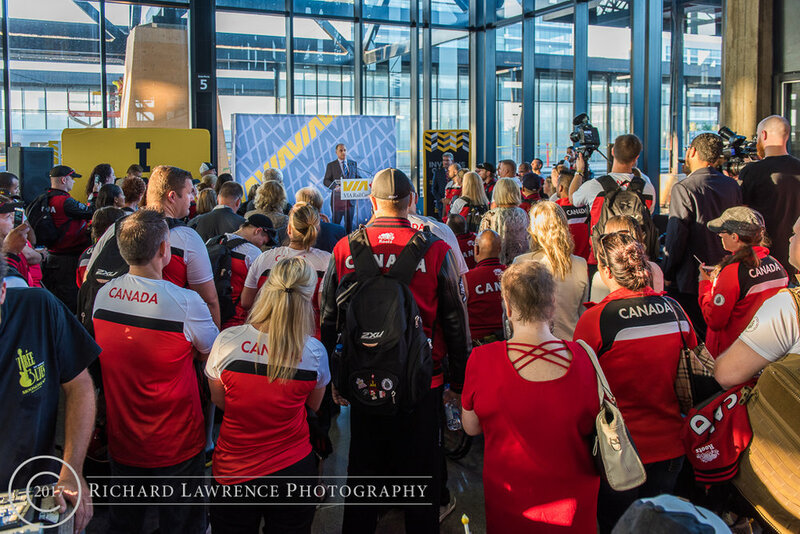 A small crowd gathered at Ottawa’s VIA Rail Station this morning to wish athletes from Team Canada well for their upcoming competitions at the Invictus Games in Toronto. Among those in attendance were Ottawa city councillor Jody Mitic, ex-serviceman and double leg amputee suffered during his last deployment in Afghanistan; Gen Walt Natynczyk, former Chief of Defence Staff now Deputy Minister of Veterans Affairs; MP Karen McCrimmon, who retired as a lieutenant-colonel after 31 years in the Royal Canadian Air Force; Minister of Transport Marc Garneau, who was a captain in the Royal Canadian Navy before being selected as astronaut; Ottawa-South MP John Fraser; and the host of the event, Yves Desjardins-Siciliano, President and CEO of VIA Rail and Honorary LCol of the Régiment de Maisonneuve. After the speeches, the athletes and invited guests enjoyed the pastries and coffee supplied by VIA Rail before the call to board the train for Toronto.